WilliamsF1, the trading name of Williams Grand Prix Engineering Ltd., is a Formula One (F1) motor racing team and constructor. It was founded and run by Sir Frank Williams and Patrick Head. The team was formed in 1977 after two earlier and, compared with WilliamsF1's achievements, unsuccessful F1 operations, Frank Williams Racing Cars and Walter Wolf Racing. All of WilliamsF1 chassis are called "FW" then a number, the FW being the initials of team owner, Frank Williams. Williams' first race was the 1978 Argentine Grand Prix, and Switzerland's Clay Regazzoni won Williams' first race at the 1979 British Grand Prix. At the 1997 British Grand Prix, Canadian Jacques Villeneuve won the team's 100th race, making Williams one of only three teams in Formula One, alongside Ferrari and fellow British team McLaren, to win 100 races. Williams won nine Constructor's titles between 1980 and 1997. This stood as a record until Ferrari surpassed it in 2000. Many famous racing drivers have driven for Williams, including Finland's Keke Rosberg; Britain's Nigel Mansell and Damon Hill; France's Alain Prost and Brazil's Nelson Piquet and Ayrton Senna, and Canada's Jacques Villeneuve, each of whom, with the exception of Senna, have captured one Drivers' title with the team. After Senna died in a Williams car in a crash at the 1994 San Marino Grand Prix, Frank Williams, Patrick Head and designer Adrian Newey were all accused of manslaughter. The trial finally closed in 2005, when Williams, Head and Newey were all cleared of any wrongdoing. Williams have worked with many notable engine manufacturers, most successfully with Renault: Williams won five of their nine constructors' titles with the French company. Along with Ferrari, McLaren, and Renault (formerly Benetton), Williams is one of the "Big Four" teams that have won every constructors' championship since 1979 and every driver's championship since 1984. Williams remains the only one independently owned, as the other three are "factory teams" either setup or bought out by major auto manufacturers. The Williams FW06 from 1978, being raced at Silverstone in 2007. Keke Rosberg's Williams FW08. This car was used during the 1982 season where Rosberg won the Drivers' Championship recording only a single win over the course of the season. Nigel Mansell's Williams FW10. This car was used during the 1985 season. 1991 British Grand Prix: Nigel Mansell gives Ayrton Senna a lift back to the Paddock at Silverstone. Senna had run out of fuel and Mansell won the race. Williams FW16B, used in the second half of the 1994 season. 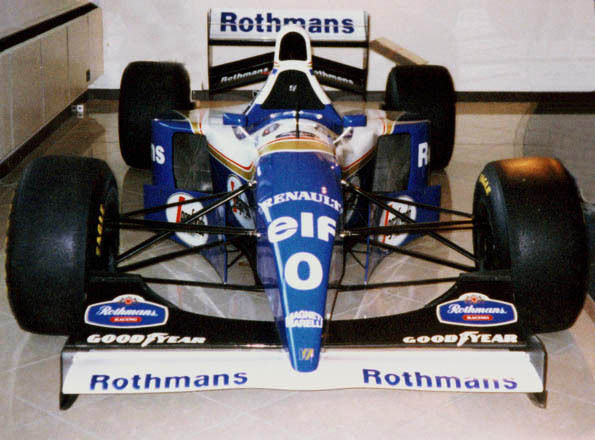 This was the first season Williams ran with Rothmans as its primary backer. 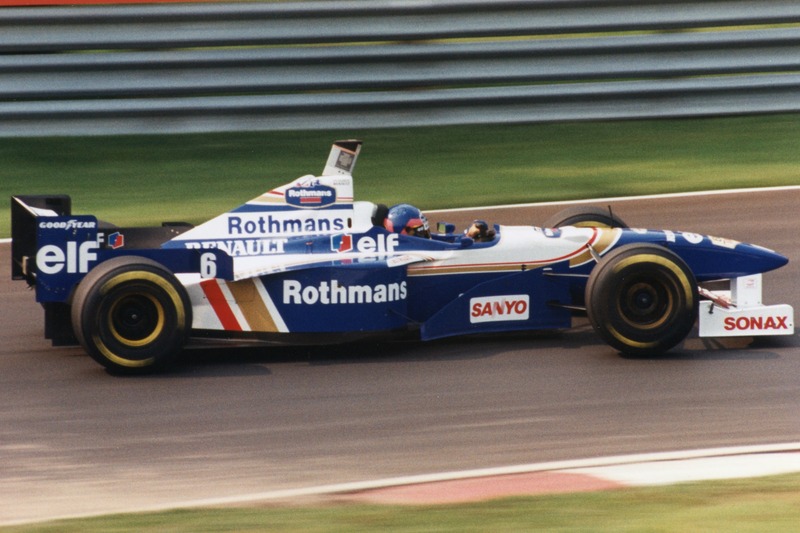 Damon Hill driving the Williams FW17 at Montreal. Hill had qualified 2nd for the race but retired after completing 50 laps due to a gearbox problem. Jacques Villeneuve driving the Williams FW18 at the 1996 Canadian Grand Prix. 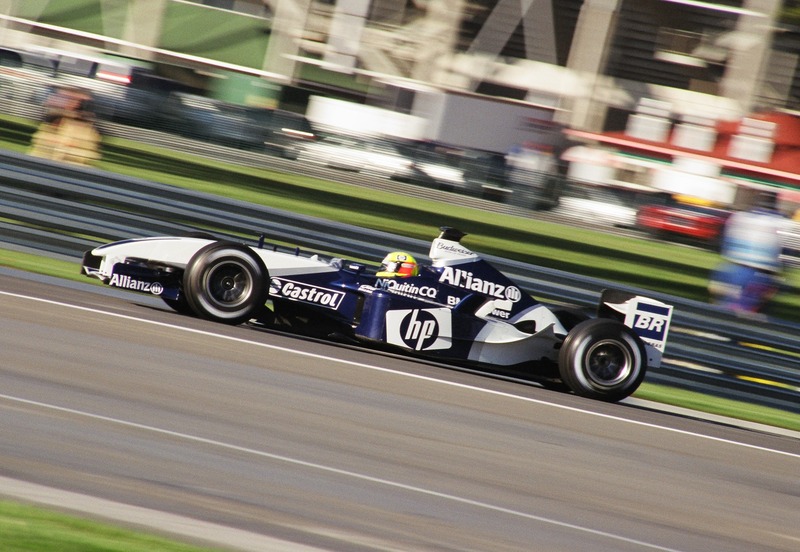 Jacques Villeneuve driving the FW20 at the 1998 Italian Grand Prix. 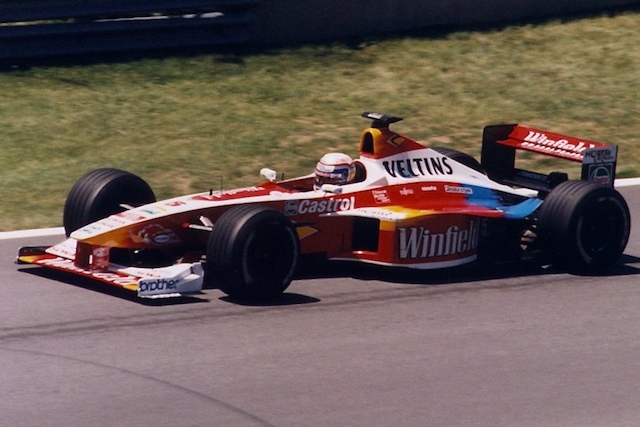 Alex Zanardi driving the FW21 at the 1999 Canadian Grand Prix. Schumacher driving for the WilliamsF1 team (chassis FW25) at the 2003 United States Grand Prix, where he qualified in fifth position before retiring after 21 laps. Juan Pablo Montoya driving the Williams FW26 with the "Walrus-Nose" design during the 2004 United States Grand Prix. Montoya had qualified in fifth for the race, but he was disqualified for illegally using the spare car. 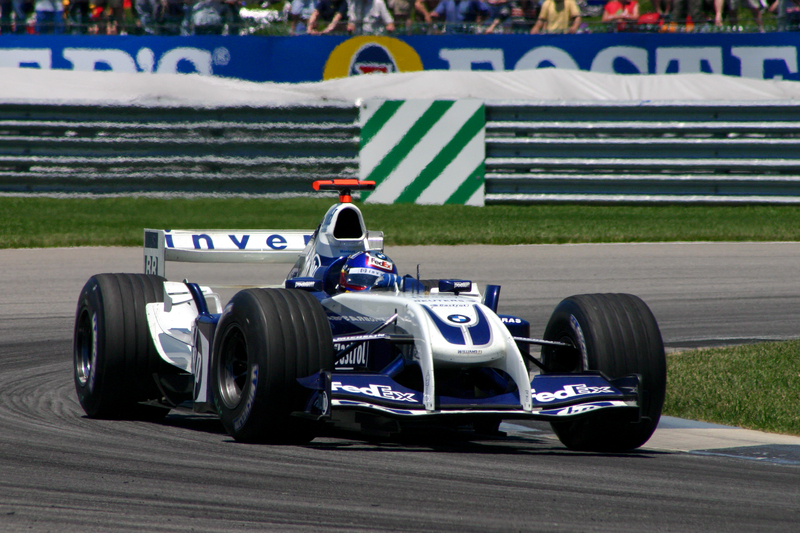 Nick Heidfeld driving the Williams FW27 during the 2005 United States GP. Nico Rosberg driving the Williams FW28-Cosworth at the 2006 Canadian Grand Prix. Alexander Wurz driving for Williams at the 2007 Malaysian Grand Prix. Kazuki Nakajima driving for Williams at the 2008 Canadian Grand Prix. Nico Rosberg driving for Williams at the 2009 Turkish Grand Prix. Nico Hülkenberg driving for Williams at the 2010 Malaysian Grand Prix. Valtteri Bottas driving for Williams at the 2013 Malaysian Grand Prix. The MG Metro 6R4 was developed by Williams for the 1986 World Rally Championship. The Williams-engineered Renault Laguna BTCC car ran between 1995 and 1999 and won two manufacturers' titles and one drivers' title. WilliamsF1 Facts for Kids. Kiddle Encyclopedia.